Kreludan Mining Corp. is one of the best games for Neopoints, as long as you practice lots and never quit. There will be a few tough spots, but the trick is to not panic or care if you lose a life. I will give you tips on the controls, and a walkthrough of the first few levels just to get you started. Alright, you're probably already familiar with the classic "use the arrow keys to move" idea. This is almost the same: you use the up arrow to go in the direction that your drone is facing. To change the direction that you are facing, simply use the left and right arrow keys to turn in that direction. The down arrow key is not used at all. Now, along the way there will be loose rocks, sentient aliens and also doors that you have to open. For these obstacles, use the space bar, which allows you to shoot out a laser. At the end of the level, there will be a piece of ore which you must return to the mining facility. Once you have returned the ore, the level will end. To send out a laser beam to pick up the ore, hold down the "B" button. If you are in a tight spot and think that the ore is about to explode (you will explode too if you're holding on to it), then press the "N" button. This will release the ore, allowing to you go back to where you found it, pick it up again, and try doing it again. I find this the most useful control. The first two mine shafts will show you almost all of the aspects of the game. Thus, they can almost be counted as a tutorial. Start holding down the B button. Now, once you're extremely close to it, do a 360 degree turn (still holding down the B button). You should be able to pick up the gem, and press your thrust button so that you don't crash into the ground. 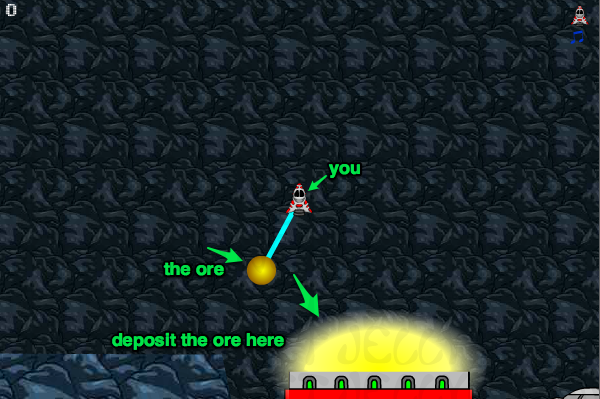 Now, you can fly over to the ore, pick it up, and drop it into the mining facility. Level two is slightly trickier: it has a sentient alien in it, and you have to carry the ore further. First, head over to the right about a centimetre. And let yourself fall. When you're falling, turn a 90 degree turn counter-clockwise and shoot the alien to your left. Right yourself, get hold of the ore, shoot straight up, and fly to the right to drop it into the facility. Level three has a total of six aliens. To get the first three, shoot the one on top first, then shoot the other two using the method you used on level two. Now go over to the top-right corner of the map, and shoot the next two by going below, and shooting, each one. Now go through the tunnel on the bottom of the room, to the left, shoot the final alien, grab the ore, and absolutely ZOOM back up. This may not seem like a good idea, but once you master it, it is extremely useful for long, jagged levels. Level four has an amazing 14 aliens, so it seems very hard at first, but once you get the hang of it, it can be very easy. You start in a large room with an alien below you. Using the tunnel next to the alien, use the method mentioned for level two to shoot it, then proceed to the top right corner of the room. Once just below the alien up there, shoot upwards, and you should hit it. Now go back through the tunnel to the next room. In the next room are three aliens. Use the level two method for them, and proceed through the next tunnel. Get directly below the alien on the top, shoot it, and use the level two method again to shoot the next three aliens (the last one is tricky). Get directly below the next alien in the tunnel, use the level two method for the next one, and go into the last room. This room has three aliens in it. Get below the two on top, shoot them, then use the level two method AGAIN (that method's getting handy) and grab the ore. ZOOM back to the mining facility and enter the next level. Shoot the alien to your right using the you-know-what method, but don't go down the tunnel yet! Go to the left, and drop down THAT tunnel. Using the aforementioned method, shoot the first alien, and using the get-below method, shoot the other one. Now, get below the door button (the round blue thing) and go through the door. Shoot the alien (you should know which method to use right now), go through the tunnel (ignore the ore for now), shoot THAT alien, go back down, grab the ore, and zoom back up to the refinery. Immediately turn and shoot the first alien, and go down the tunnel. Shoot the next alien by making it on your bottom-left and firing, shoot the door button, and use the level two method to shoot the next alien. Go to the next room and use whatever method you want (it doesn't matter) to shoot the last four. Grab the ore (carefully and slowly!) and zoom back to the refinery. There you go! A good guide to the first six levels, and the basics, of Kreludan Mining Corp. I hope you have enjoyed my guide!